It’s high time to wipe the rose tint from the media’s lens on Germany as the shining bastion of Willkommenskultur. In the immediate wake of the massacres in Paris last Friday, the finance minister for the German state of Bavaria, Markus Söder, feverishly called for an end to Chancellor Angela Merkel’s so-called “open-door” policy on refugees. “The days of uncontrolled immigration and illegal entry can’t continue just like that. Paris changes everything,” Söder said. But Söder’s hawkish hyperbole paints a misleading picture. Germany’s doors have not been nearly so open as his comment suggests. Nor, indeed, have the chancellor’s arms. For these words, Altmaier, Merkel’s most trusted adviser, received a swift skewering from social media and the German commentariat. Who, exactly, could remain in Germany under this standard? What counts as safe? The chancellory chief’s tweet could be dismissed as an incautious bungle. But his glee at swiftly expelling the not-quite-desperate-enough reflects the increasingly draconian and anti-immigrant realpolitik defining the German government’s stance on refugees. It’s high time to wipe the rose tint from the media’s lens on Germany as the shining bastion of Willkommenskultur. History shows that, for Merkel, political calculus leads. We saw no humanitarian generosity, for example, in Greece. Then, too, has been the elevation and near-deification of Merkel-as-savior, the Mutti. German weekly Der Spiegel depicted the chancellor as Mother Teresa in September. The Guardian’s Alberto Nardelli essentially claimed that Merkel is the lone defender of refugees in Europe. A November cover of The Economist proclaimed her “the indispensable European.” The story inside described a figure of unique moral fortitude, facing crueler European counterparts and members of her own party dedicated to dislodging her “mission” of “keeping Germany open and tolerant.” “She has boldly upheld European values, almost alone in her commitment to welcoming refugees,” The Economist states. Let’s leave aside for a moment the empty and historically disproven platitude that European values entail acceptance and respect for Ausländer. It must be admitted that Merkel’s impulse towards a more open border policy has set her above her European peers. Compared to Hungary’s Viktor Orban, who froths at the mouth with xenophobia, Merkel is indeed saintly. Blustering US governors threatening to block the entry to their states of all Syrian refugees, even when America has offered only to take 10,000 highly vetted candidates in the first place, make the chancellor seem a paragon of charity. And it would be reductive to suggest that she is devoid of genuine concern for the millions of people seeking a place of safety. But, in the case of Merkel, history and parsimony suggest that political calculus leads. We saw no such humanitarian generosity this summer as she maintained her tough stance on technocratic Europe’s devastating austerity plans in Greece. The glorification of Merkel, indeed, distracts from a more nuanced assessment of Germany’s approach to refugees. Merkel’s current term as chancellor ends in 2017, and it is unclear whether she will run in the next election. It thus makes sense to judge her actions now in terms of legacy-forging. After decades of realpolitik maneuvering, Merkel has room for a grand gesture on her way out. Showing a kindly face to desperate people is already paying off in the international media. And while it is preferable that the chancellor, in her to final act, aim to play the welcomer, not rejector, of desperate people, the grounds for her popular canonization are shaky, to say the least. "Merkeln"–to Merkel–is a recent Deutsch coinage, meaning to be indecisive and failing to have an opinion. In August, hundreds of right wingers, including a strong contingent of neo-Nazis, demonstrated violently outside a new refugee shelter in the small town Heidenau in eastern Germany. The crowd threw stones and bottles and tried to forcibly block approximately 250 refugees from accessing the facility. For days, ugly scenes continued, with arson attacks and street fights with the police. And for days, Merkel was silent. The hashtag, #merkelschweigt (Merkel is silent) spread across Twitter. Spiegel writer Georg Diez tweeted on August 24, “#merkelschweigt is no failure or accident, it is the principle of her politics without politics, praised for so long by editorial writers.” Two days later, public pressure weighing heavy, the chancellor went to Heidenau and called for tolerance. 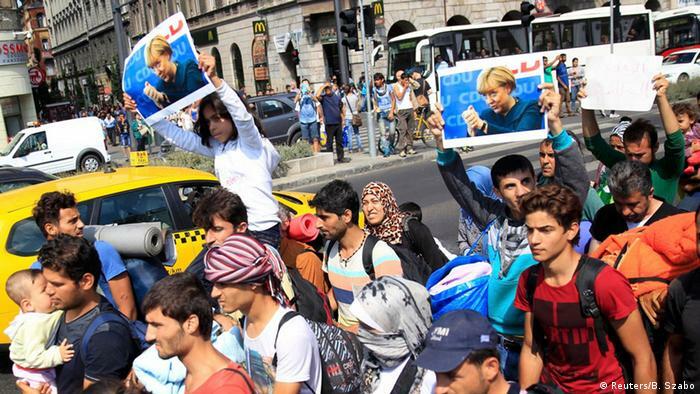 In mid-September Merkel spoke the now-famous words, “If we now have to start apologizing for showing a friendly face, that’s not my country.” The phrase resonated as an impassioned expression of the German Willkommenskultur that has garnered so much praise abroad. But it was uttered on the very week that Merkel and her government backtracked (within weeks) on the plan to open Germany’s borders to unregistered refugees. That week, temporary border controls were established along Germany’s frontier with Austria. It remains unclear how refugees, with scant possessions, gained access to so many high-res images of Merkel. 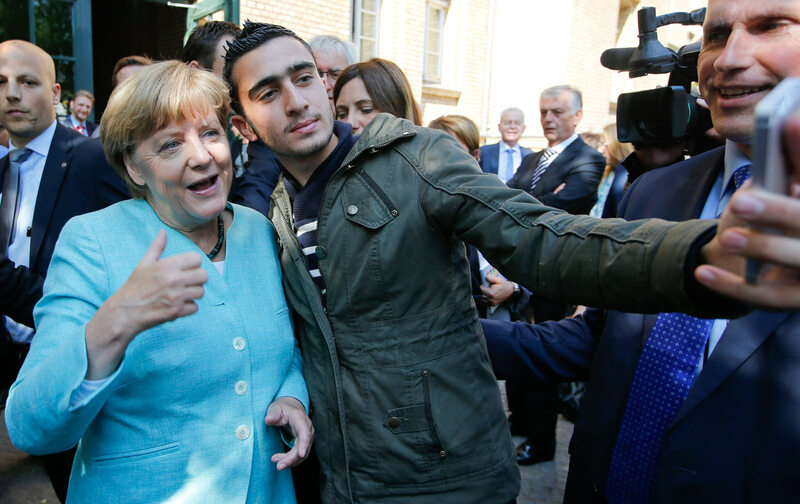 Merkel’s rhetoric focuses on Germany having shown a “friendly, beautiful face.” She has ensured that Germany’s “friendly face” was, quite literally, hers: She posed for selfies at an asylum center and refugees held up color printouts of the chancellor’s face. It remains unclear from our inquiries how refugees, having faced perilous journeys with scant possessions, gained access to so many high-res Merkel images, many with her party’s logo in the background. The chancellor managed to frame criticism of her (mitigated) welcoming of refugees as an affront to Germany. Germany has shown a friendly face—this is Merkel’s country. And behind the visage, xenophobic sentiments not only permeate Germany’s troubling right wing, but mainstream political actions—this is Merkel’s country, too. The policies announced last week by Merkel don’t match her friendly rhetoric. First, to the tweeting glee of the German chancellory chief, new measures will include cutting cash benefits to asylum seekers if they leave designated shelters, speeding review of asylum applications, expediting the departure of rejected applicants, and making it more difficult for Balkan state citizens to gain refugee status. Registration centers will be set up around Germany where those claiming asylum, with unlikely hopes of being granted the status, will be reviewed quickly and potentially deported if the claim is rejected. The policies Merkel announced last week, restricting benefits to refugees, don't match her friendly rhetoric. A further plan still in negotiation, but likely to pass with the support of the Christian Democrats, would see all Syrian refugees denied asylum status, which typically includes a three-year stay and the ability to bring one’s family. Instead, they would be granted lesser, so-called subsidiary protection, which tends to grant a one-year stay. The new proposals would also mean that Syrians, as subsidiary protection recipients, would not be allowed to bring their families to join them. These tightened restrictions have caused tensions within the coalition government, over which, typically, Merkel has as yet been largely silent, #merkelschweigt again. For the press, the chancellor can repeat her stoic refrain du jour, “Wir schaffen das” (We will manage)—it’s a slogan as unfinished and empty as Obama’s “Yes we can.” Can what? Manage how? Management could well look draconian. But such platitudes helped win the US president a Nobel Peace Prize, and almost did the same for Merkel, nominated this year. The ink spilled over the chancellor’s tensions with her own government—she, the refugee’s hero, facing colder-hearted cabinet members—too often ignores the fact that Merkel is often aligning with her government’s more restrictive bent. Accepting refugees will not be the cross on which the chancellor chooses to die, because she won’t die at all. She will manage. Meanwhile, outside the Reichstag, popular attitudes toward refugees in Germany are also at odds with the country’s glowing international reputation. Most troubling, of course, is the violence. According to federal statistics, this year has seen more than 500 attacks on refugees and refugee facilities. Freitag’s Augstein was moved to compare the current mood with the atmosphere during the Weimar Republic. This year has seen more than 500 attacks on refugees and refugee facilities in Germany. Neo-Nazi assaults are the obvious face of anti-refugee, especially Islamophobic, sentiment in Germany. But more insidious examples point to a normalizing of distrust for refugees, which is far from fringe. German Finance Minister Wolfgang Schäuble joined the cadre of leaders who have referred to fleeing people as a dehumanized, dangerous mass when he described them last week as a potential “avalanche” (British Prime Minister David Cameron opted instead for the “swarm” metaphor earlier this year). This sort of parlance, often followed by a meek public apology, seeps nonetheless into a poisoned public discourse. Consider an article published in the magazine of the teacher’s association of Sachsen-Anhalt, a state in east Germany. The head of the association, Jürgen Mannke, wrote of young male refugees, “It is just natural that these young, often uneducated men also have a need for sexuality.” He also warned young women to not “engage in superficial sexual adventures with surely often attractive Muslim men.” The specter of the barbarous moor lives on, it seems. The efforts of German citizens to welcome and help refugees and organize facilities and provisions, including opening up their own homes, should not be devalued. Germany continues to see networked volunteer organizing on a huge scale. These sort of acts, outside the purview of realpolitik, give promise and content to Merkel’s “We’ll manage” refrain. But images of welcoming committees at Munich station, and the popular insistence on #refugeeswelcome, should not be sufficient to earn Germany—or its leader—a sparkling reputation. The attacks in Paris will likely lead to more restrictive and reactionary policies toward refugees across Europe, even though the Paris police have now stated that the Syrian passports found on one of the attackers is a fake. But if German policy shifts further towards exclusion and restriction, this is not an about-face response to the massacre. The country and its chancellor have harbored un-Willkommenskultur for some time.